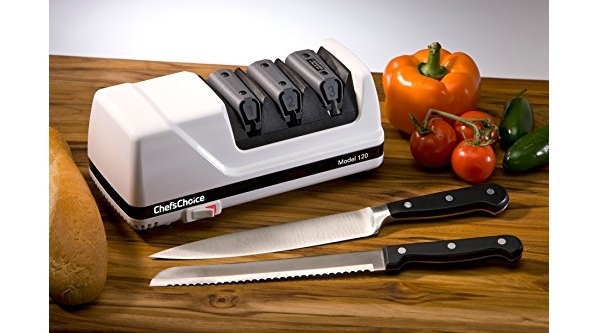 Deal of the Day: Highly Reviewed Chef’sChoice 120 Diamond Hone EdgeSelect Professional Electric Knife Sharpener, Lowest Price! Today ONLY, Amazon is offering the lowest price to date on the highly reviewed Chef’sChoice 120 Diamond Hone EdgeSelect Professional Electric Knife Sharpener for JUST $89.95 (reg. $130.00) shipped right to your front door! This lightning fast professional home sharpener creates, in seconds, the novel Trizor-Plus edge which can be customized to suit each cutting task! 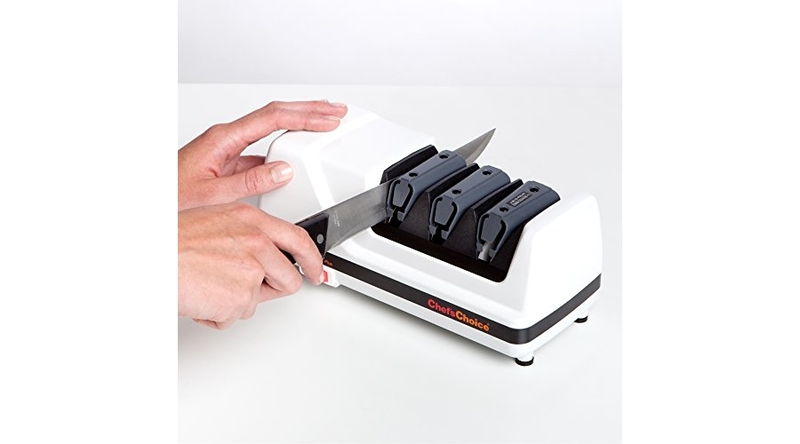 It sharpens straight-edge and serrated knives and is so easy to use, anyone can put astonishingly sharp, long-lasting edges on knives in seconds. You can select extremely sharp hair-splitting edges that slide smoothly and effortlessly through delicate foods like smoked salmon and prosciutto or alternately, edges with varying amounts of “bite” for more demanding jobs, like cutting tough fibrous foods and meats. 100% fine diamond-coated conical disks in Stage 1 and Stage 2 form the first and second bevels of a durable, arch-shaped edge. In Stage 3, a revolutionary flexible stropping disk creates an ultrasharp polished third bevel and cutting tip while polishing the first two bevels to form sharp cutting flutes that enhance the cutting action on both sides of the edge. Built-in high-precision elastomeric angle guides eliminate guesswork and ensure hair-splitting sharpness time after time. It’s ruggedly built and backed by a limited 3-year warranty. The unit is compact approximately 10” long x 4” x 4”. Resilient elastomer feet hold the unit securely to the work surface. The Chef’sChoice Diamond Hone EdgeSelect Plus Model 120 requires no sharpening oils or liquids. Engineered and assembled in the USA.